On 21st June 2017, A GoAir Airbus A320-200, flight G8-338 to Mumbai (India) with 158 passengers and 6 crew, was in the takeoff roll at 05:33:20 hrs on runway 09 at Delhi Airport, when a bird struck the right hand engine (CFM56) causing vibrations and abnormal sounds. Being unsure of the reason for vibrations, the crew continued takeoff, stopped the climb at 3300 feet, shut the left hand engine down and decided to return to Delhi. The crew subsequently recognized they had shut the wrong engine down, restarted the left hand engine and reduced the right hand engine to idle. The aircraft landed safely on runway 10 about 20 minutes after departure. During take-off roll, crew experienced abnormal sound & vibrations. Being unsure of the reason for vibrations, First Officer enquired PIC for rejecting take-off but PIC decided to continue for take-off as he was not sure that the aircraft would stop within the available runway, if executed rejected take-off, and probably wanting to investigate the problem after getting airborne. ECAM advisory for high N1 vibration of Engine # 2 came at 05:40:32 hrs as value of N1 vibration of Engine # 2 reached above specified limit, i.e. ≥ 6. The vibration advisory was not called out by First Officer. Aircraft IAS was 129 knots at this stage. Values of V1, VR & V2 were calculated to be 146 knots, 146 knots and 147 knots respectively. After getting airborne, cockpit crew noticed the problem of high engine vibration but assessed the situation incorrectly. As a result, they shut down the Engine # 1 (unaffected engine) by putting its MASTER- OFF at 05:41:48 hrs and increased power to TO/GA on the Engine # 2 (affected engine). Crew declared emergency due to engine problem to ATC, Delhi at 05:41:50 hrs and requested immediate turn back to Delhi for landing, which was granted by ATC. During subsequent conversations while climbing, wherein PIC inquired about the engine vibrations, First Officer repeatedly prompted PIC about Engine # 1 vibration out of limits. The aircraft was climbing on affected engine’s power varying from TO/GA to CLIMB while the unaffected engine was shutdown. On directions from ATC, aircraft stopped climbing at 05:43:13 hrs at around 3330 ft altitude. 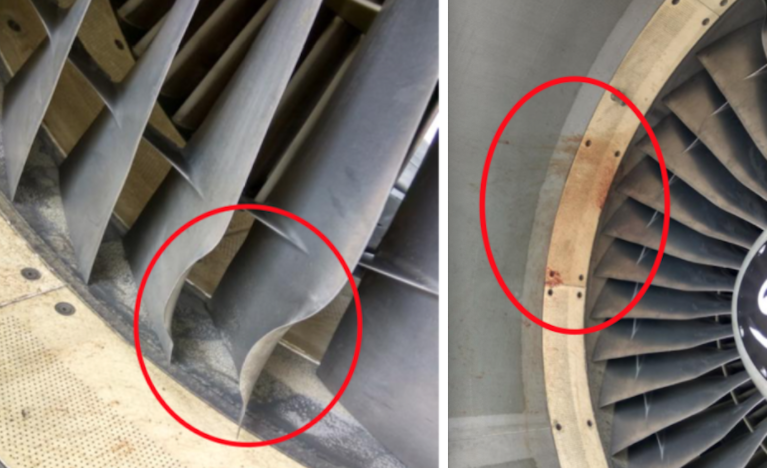 Subsequently, PIC recognized that the Engine # 2 is affected with high vibrations. Crew realized their mistake at 05:43:42 hrs about shutting down the wrong engine and decided to switch on the unaffected engine.